Put in anywhere is Keystone and run to the lake. Although this run must classify as III+, it is boring considering its gradient with little play, but not enough vert for the creek boat! Beautiful scenery and a surf wave in the Hwy 9 tunnel round out this run. 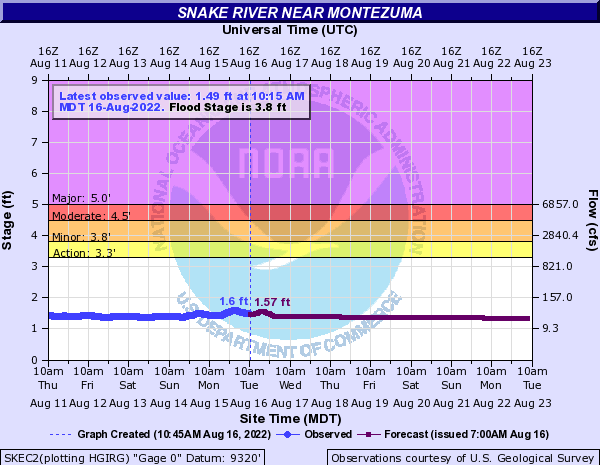 Primary Gauge SNAKE RIVER NEAR MONTEZUMA, CO.
Watch for the first stoplight as you enter Keystone from the N. on Hwy 9. Park in the dirt pulloff just after the bridge over the river. There are a few hundred meters of flatwater between this putin and the action, but no legal access below exists. Park in the large fishermans lot off Swan Mountain Road. The bridge under the highway is a steep concrete box. As the river gains momentum in this sluice it forms a nice surf wave at the very end of the tunnel. Moves are rarely possible but its a unique experience! Cannot be scouted. Run the bridge and look ahead as you approach to see if this is your cup of tea.